Trixer by Rhythmic Robot is Soundware (e.g. samples or presets that load into other products). 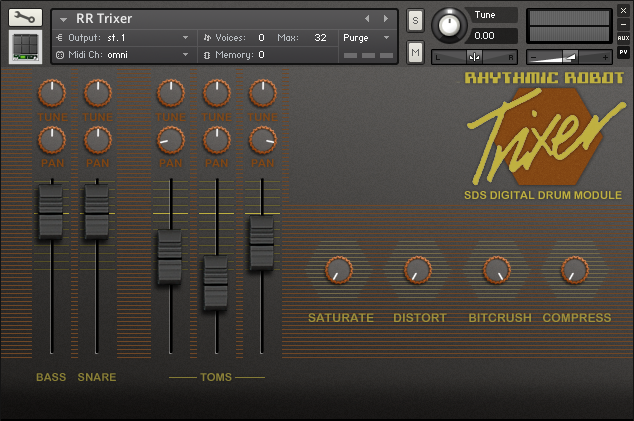 Rhythmic Robot's Trixer is a Kontakt emulation of the Simmons Trixer, a drum-triggering module from the 80s packed with authentic Simmons SDS sounds. Drawing on the library of classic drum tones which had powered the hexagonal Simmons pads and "brains", the Trixer repackaged these into an audio-triggered mixer (hence "Trixer"...) In practical terms, it was an excellent way of getting THE Simmons Sound at a budget price. Our recreation samples the original Trixer at 24-bit, with multiple round-robin samples to preserve its natural variation in sound. There are four kits to choose from: Rock1, Rock2, Jazz, and the mighty Electronic kit – instantly recalling 80s-era chart toppers from Phil Collins, Ultravox, Pink Floyd, Culture Club, Van Halen and more. 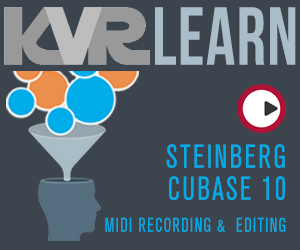 Full control over kit-piece tuning, level and pan is presented simply on the front panel, while a compliment of basic effects (saturation, distortion, bitcrushing and compression) allow the user to sculpt the sound. To round things off, a glitch in the hardware allows a "rolled snare" sound to be triggered accidentally; this has been sampled and is now fully user-controllable. Trixer is an ideal way to add the much-loved sound of the 80s to your tracks. All four kits of the Simmons Trixer. Rock1, Rock2, Jazz and Electronic kits. Multiple round-robins capture all the nuance of the original. Trixer is available now from Rhythmic Robot and requires Kontakt v4.2.3 and later (including all versions of Kontakt 5). It's not compatible with Kontakt Player.